Aside from all the announcements about autonomous driving tests and driverless ridesharing services coming down the road, some automakers are moving one small step at a time in connecting cars for practical reasons for drivers. Audi is a good example. The automaker just introduced a vehicle-integrated toll payment system on some models so that car owners don’t have to stick an additional device onto their windshields to pay for road tolls. The Integrated Toll Module (ITM) is a toll transponder built into the vehicle’s rearview mirror. The technology is compatible with existing tolling agencies nationwide, which can be linked with a driver’s new or current account, according to Audi. Audi has been working on another down-to-earth innovation, connecting some of its cars with traffic lights. 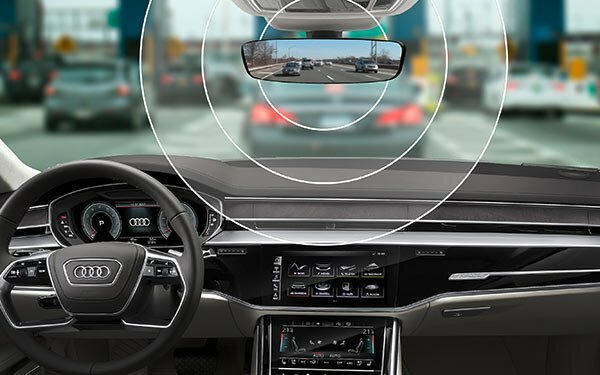 Audi created a feature called Traffic Light Information so that its cars can communicate with the traffic infrastructure in certain cities and metropolitan areas, which started testing in Las Vegas some time ago, detailed in a video from Audi. When a car comes near a traffic light, a dashboard display shows the time remaining until the traffic light turns green. The idea is that eventually traffic light systems and cars will be interconnected so that lights will be more reflective of traffic on any given road. Audi is not alone in the traffic light department, as General Motors has been testing receiving real-time information from specially equipped traffic lights in Michigan. While companies like Waymo, Apple, Uber and others go the longer ball of self-driving cars, some automakers a plodding along, introducing one practical connected feature after another. 2 comments about "Audi Integrates Toll Payments Into Car". R MARK REASBECK from www.USAonly.US , February 21, 2018 at 9:54 p.m.
All's well 'n good, UNTIL, the system fails , or hits a glitch, failed software, or hackers. But one more piece of privacy is given over, and hooking up your bank account to yet one more "debit-er", not to mention your location is never a secret. I lived in Vegas 50 years. Anybody who lived there any length of time, knew the traffic light patterns. 43 mph on certain street, never hit a red light. Chuck Martin from Chuck Martin replied, February 22, 2018 at 9:51 a.m.
And the tech marches on, Mark.